To see more Liberty Hill pieces... visit our Liberty Hill Page! I have always loved this little guy! Definitely an *oldie but goodie* chart -- it was published in 1996! (The price is $5!!!) 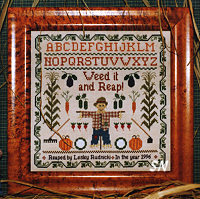 A cute little scarecrow is tending his organized vegetable garden -- it measures about 8 x 8 on 32ct. Lesley designed this before all the hand-dyeds were prevalent... so you might be able to grab some cool colors from your stash, rather than doing all the blended needle colors she's called for in here! Just a timeless little design -- presented in a leaflet. One of several new Hillside releases... I love this charming willow tree 'dripping' with Lazy Daisy branches wilting down to the Scotch-Stitched grass and hand-dyed pumpkins! Smyrna Crosses in the border, Satin in the tree trunk, this petite piece is stitched on 40ct Sandstone linen using Weeks overdyeds of Cocoa, Kudzu, Whiskey, Carrot and Chrysanthemum, and it is stunning!!! Finishing a mere 4 x 5 on the 40ct... it can be larger if you choose a different fabric. The special stitches give lots of texture and interest in this. Offered as a leaflet... check out all the other new things by Hillside as well! 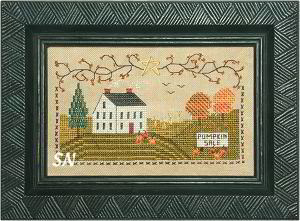 A calming white farmhouse tucked into the hills of fall grass and pumpkins... this is a fun Fall piece that is stitched on 32ct Country Mocha Belfast linen in shades of Weeks overdyed flosses. TONS of Rhodes and Elongated Cross Stitch variations make up the pumpkins, trees, and cornstalks... so cool on smaller count fabrics in a pic like this! Finishing only 3 x 5-1/2 on 32ct, this is offered as a leaflet. Great balance, fun stitches, awesome color!!! By Hillside Samplings, a sewing basket set complete with a needleroll, pin cushion and matching scissor fob design. This is stitched on 32ct Natural Belfast linen, and is full of special stitches and neat little details! There are complete finishing instructions included in the 12 page leaflet. This is the third in Hillside's collection of stitching baskets, they're all really cool... and such fun things to stitch! Here is the collection of sewing basket designs from Hillside Samplings! Originally designed to fit a miscellaneous-sized basket, we fit our needlework around the popular Longaberger® baskets! 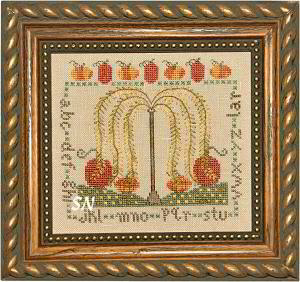 Stitched on linen banding, there are lots of pretty stitches used, and colors that everyone seems to love!. 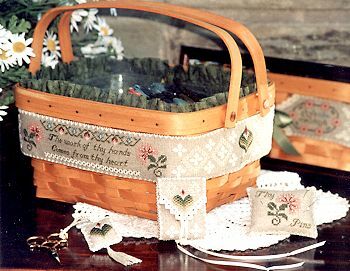 The cushions and needle cases that coordinate with each basket are charming, as well. Each basket pattern is available as a leaflet, and there is a small embellishment pack available for each. 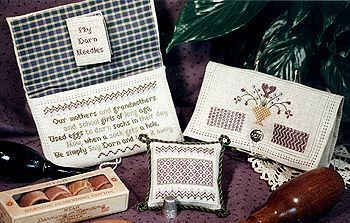 The Sampler Sewing Basket and That Darn Basket have been available for a few years, but still draw comments and interest in the shop! Remember to order Those Darn Accessories... the cool sewing case and pin cushion that fill your Darn Basket!